Small Town Creamery is a fairly new ice cream shop on Anna Maria Island, nestled in the corner of the Island Shopping Center across from Holmes Beach. This is a popular area for tourists as it houses an incredible selection of food, fun, and shopping. We were first drawn to the shop because of the vibrant signage, and the must-see Mr. Sprinkles standing outside the door. The windows were filled with treats and toys, begging us to come inside to see more. Inside, there we found a huge display of kid’s toys, snacks, wine pops, handmade fudge, and ice cream flavors that were literally making our mouths water. It became evident that this was not “just another ice cream shop” on AMI. After sampling an assortment of flavors, the sales rep at the time immediately asked if they would be willing to barter advertising for ice-cream! It was that delicious. Upon meeting the owners, Lindy Gilbert & Dennis Miller, we learned they were in need of a new website. Lindy and a good friend of hers built a website previously using a popular template builder and had reached a stopping point due to lack of time/ patience with the template restrictions. Many of the pages were empty, and not a chance of Google picking it up on an organic search. We did some research and built a campaign that would work well with their budget and needs.We opted for a WordPress website for Small Town Creamery so that their new site would be user-friendly, but easy enough for her to edit should they ever want to make revisions themselves. Lindy provided nearly all of the artwork, and we were blown away by her Adobe skills. It’s not often that we meet new clients who so willingly give us all that we need to make a website succeed. It was very important to the owners that the site looked visually stimulating and commanded the same attention to detail that customers have come to expect when visiting Small Town Creamery. Many of the elements she requested were simple font/color changes, but some of the other details desired were not compatible with the theme we selected. We explained that the design is just one part of the bigger picture, and that it would require some level of customization and creative thinking to get the desired look. After several months of edits and revisions, we completed the look Lindy was aiming for. Some of our favorite features of the site include the animated slider, responsive design, and how wall it’s ranking organically even though we haven’t begun the indexing or optimization yet. We love web design. It’s a big part of who we are, but we know that there is more to online success than color schemes and page layouts. In addition to site speed, and incorporating more interactive features, we will actively maintain the way the site looks, and how its found by the public. We’ve recently launched the fresh new WordPress site, at http://smalltowncreamery.com/ and have decided to tackle the lack of visibility online organically. We began by registering it with and maintaining the existing search engine listings that their customers frequent. 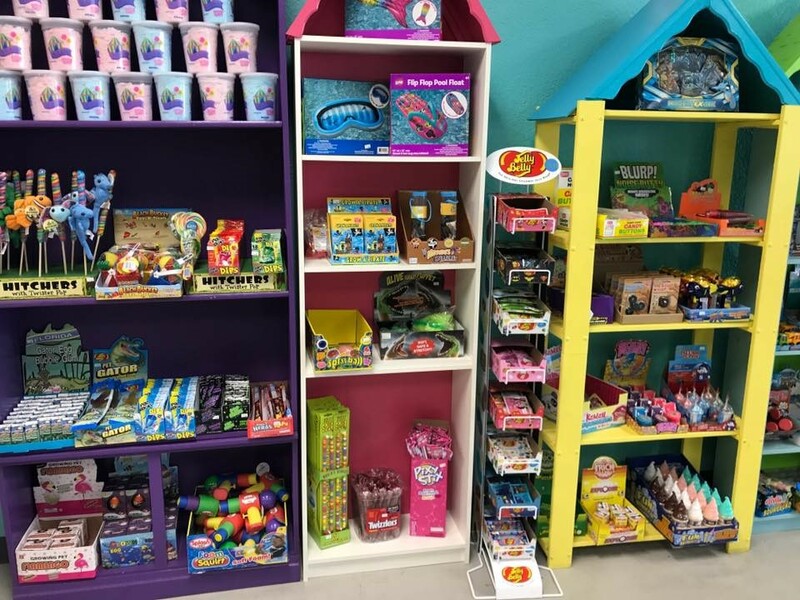 We’ll go through each page of the site and optimize it for search results so that all of the efforts we’ve all put into the site build can easily be found by anyone looking for toys, sweets, ice cream, and candy on the island. There is no need to pay search engines when there are so many customers actively looking for ice cream etc. in this area. If we simply make STC an option when people search, say from their phones, then we believe viewers will like what they see, and find all of the information needed to make an educated decision about why they should go to Small Town Creamery. UPDATE: It was a lot of fun working with Small Town Creamery, and we sincerely hope you’ll visit the site and let us know what you love! They’re on all of your favorite social sites, in your local Island Comber guide, and would love to hear your feedback. Check them out today! 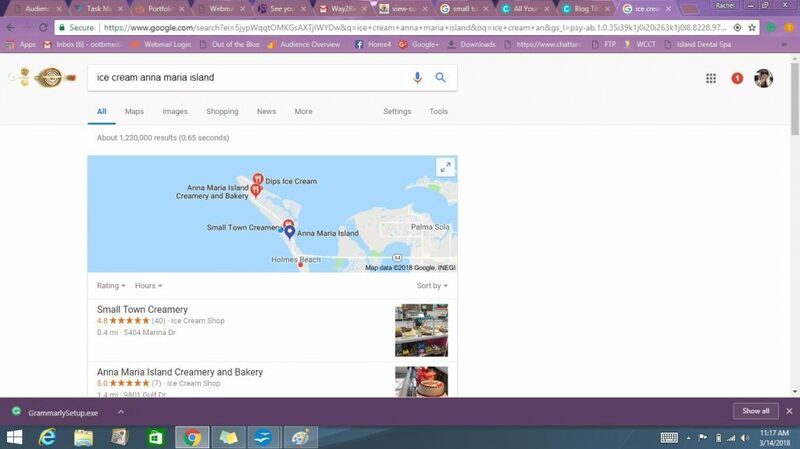 CHECK IT OUT ^ 1st on Gooogle for Ice Cream Anna Maria Island! Woot Woot.